LeCLAIR.vision This site is stovetop safe! “LeCLAIR.vision” is a resource for the identification, use, and care of VISION(S) glass-ceramic cookware. The focus is on vintage cooking vessels created by Corning and its subsidiaries. Please feel free to join the Facebook group to ask questions and share info about your collection. The initial version of the Sculptured VISIONS line has been added to the Identification Guide. Though available in select overseas regions in late 1988, it didn’t reach the United States until 1989 where it was targeted toward higher end department stores and speciality shops. Information covering Amber VISIONS roasters, “Heat ‘n’ Eat” dishes, and the “Oven / Microwave VISIONS” line has been added, as well. 'Visions' is a registered trademark of Corelle Brands. 'CorningWare' and 'Pyrex' and are registered trademarks of Corning, Incorporated. All other trademarks remain the property of their respective owners. This site is not affiliated with any of the above mentioned companies or brands in any way. No infringement is intended. It is for entertainment and informative purposes only. Visions is a brand of innovative glass-ceramic cookware originally created by Corning France. 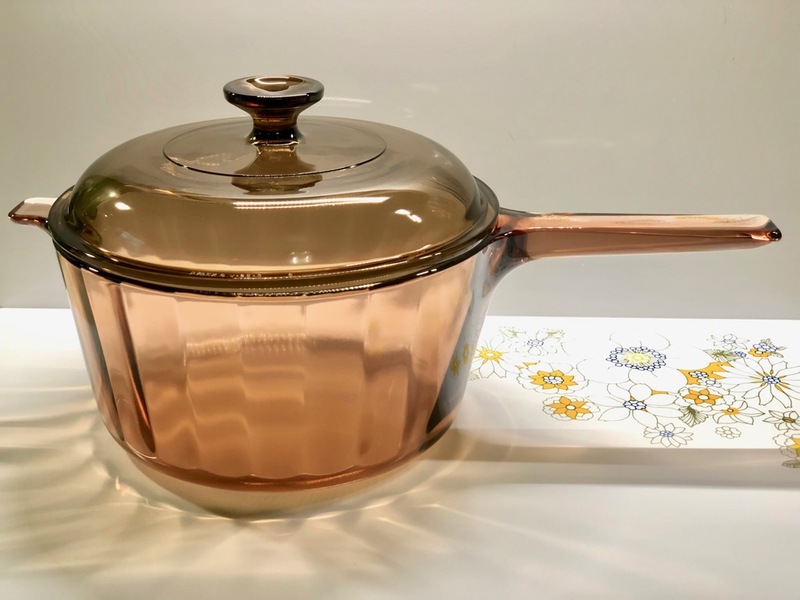 Released in Europe during the late 1970s and early 1980's, it was officially introduced in the United States during the latter-half of 1983 and became the number one selling cookware set for a number of years. Notable for its transparency, it is commonly seen in an amber or cranberry tint. Some model lines feature painted decoration, sculptured bodies, and SilverStone non-stick coating. A white variant was sold in some regions as "White Visions" and "Pyromax". Visions is made of Calexium, a material belonging to the Pyroceram family of glass-ceramics. It features thermal characteristics similar to Corning Ware, plus improved resistance to staining and the detrimental effects of acids and detergents. 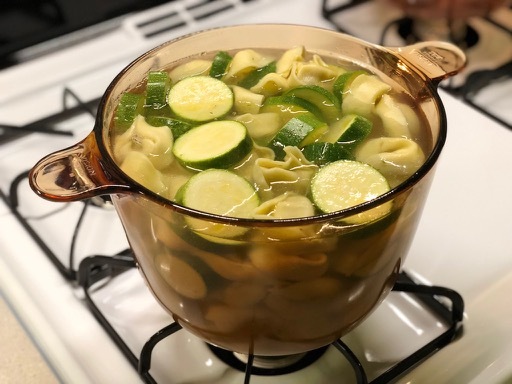 It will withstand heat up to 850°C (1,560+ °F) and is safe for use on a gas or electric stovetop range as well as in the oven, under the broiler, and with a microwave. Additionally, due to it's ability to survive a temperature differential of up to 900F, it can used for food storage in refrigerator or freezer and be taken directly to stove and then table or sink without worry of shattering. It's also great for combination cooking. One piece of Visions can do the work that would typically require numerous pieces of more conventional kitchenware. Finally, it is a very healthy choice due to it's non-porous nature, Visions will never stain, harbor odors, or leach anything into your meals. Visions has been available non-stop for nearly 40 years and is currently sold worldwide by Corelle Brands, LLC.